This luxury juicer will make some of the most high-quality juice you will taste, packed with vitamins and minimal pulp. You can get a top performing juicer for under $100 despite popular belief and this Hamilton Beach 67650A Big Mouth Pro Juice Extractor will prove it. Enjoy delicious juice packed with nutrients from the Tribest Green Start Elite twin gear juicer. Juice your leafy greens, fruits, and hard vegetables in this Omega VSJ843RS Vertical Slow Masticating Juicer. This masticating juicer has the technology to professionally extract the juice from the ground fruit and veggies producing a delicious, cold-pressed juice. Everything that you love to eat and drink is enjoyed even more when you can make it from the comfort of your own home. If you’re a fan of juicing and drink them regularly, then you know that a juicer can cost you up to 10 dollars per juice. That is simply not feasible, especially when you can make juices right at home. 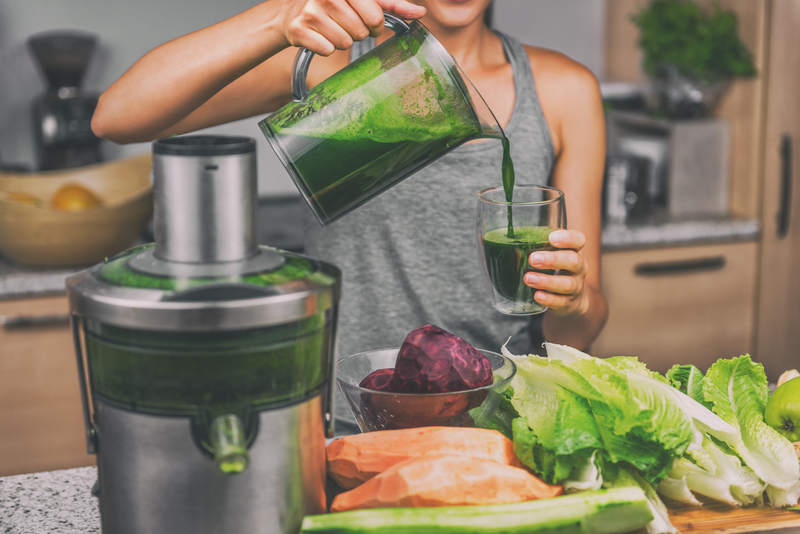 Since juicing has become a popular way to absorb nutrients into your diet, we’re taking a look at some highly rated juicers so you can find the best juicer for your home. Not familiar with the ins and outs of juicers? We get it, choosing a juicer can be daunting and there are a few different kinds to choose from. Our buyer’s guide will break down everything you need to know about these machines from the different types to what exactly to look for in a juicer. Here are our top 5 best juicers that you’ll want to buy. 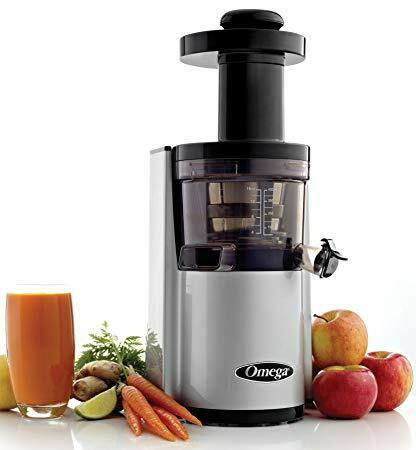 The Omega VSJ843RS gives you all of the great qualities of a masticating juicer, but with the simplicity of using a centrifugal. The large chute allows you to feed in bigger chunks to press your juices. This masticating juicer is perfect for juicing your leafy greens, soft fruits, and even hard roots. The vertical design is great for a kitchen with limited counter space and is easy to store as well. This juicer is perfect for both new juicers and experts alike, as it tested well with plenty of different products. Don’t worry about clean up and use either, it’s “Easy Clean” feature cleans up the pulp while you juice so your clean up process is less tedious. Overall, we love Omega VSJ843RS and it’s features that make high-quality cold-pressed juices. You don’t have to fork over hundreds of dollars to make great juices from the comfort of your home. The Hamilton Beach 67650A is the perfect option for juicing all of your fruits and veggies without spending too much money and getting the best value. Coming in at under $100, this juicer also fares well when it comes to the quality of the juice. The Big Mouth Pro is exactly as it suggests, a juicer with a large chute that allows you to bigger chunks. This gives this high points in the ease of use arena, compared to other juicers on the market. 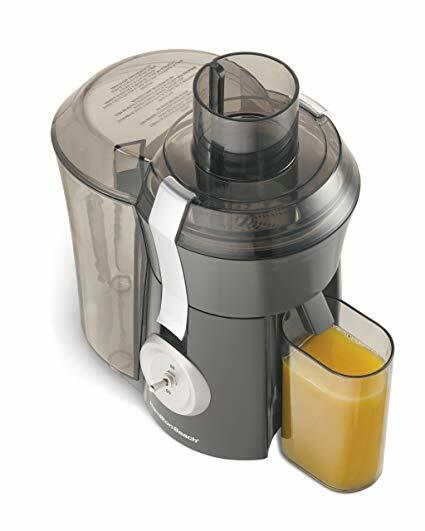 The Hamilton Beach is a centrifugal juicer which means it produces the juice fast and easily, and many users claim little no pulp in the finishing product. To conclude, this is the best value option that won’t hurt your pockets but will instead give you delicious, healthy juices every day. Smeg makes vintage-inspired household appliances and gadgets that will get your home a 50s vibe. Their appliances are some of the most aesthetically pleasing options of the entire appliance world, and they perform just as well. 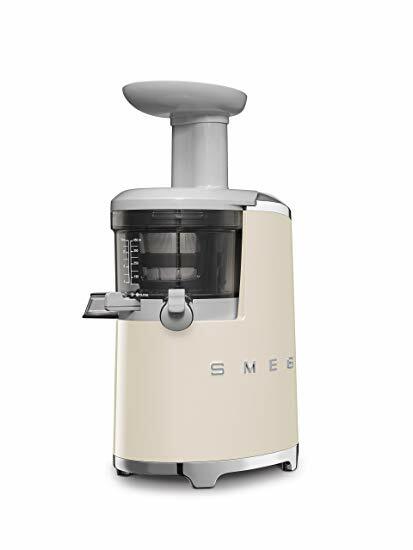 The Smeg Slow Juicer is no different. This juicer works in 43 rotations per minute, producing the delicious, slow-churned juice that everyone loves. You can buy this classic-looking juicer in several colors on Amazon. The sleek design and the high-quality juice that comes from this Breville 800 JEXL juicer gives it the nickname “Rolls Royce” of juicers. This powerful juicer can handle both hard and soft fruits and the wide mouth allows you to cut down on the time prep time. Do you think you don’t want a centrifugal because of the foamy result? You won’t have to worry about that with this juicer due to its foam protector that blocks the foam from getting into your cup. The Breville is constructed to dispell all of the centrifugal juicing myths while making a fast, high-quality juice that everyone loves. The body is made with stainless steel that is both durable and aesthetically pleasing. The vertical build is also great for both storage and counter space. The Tribest is one of the highest-rated twin gear juicers out there. The Green Star Elite label ensures that you’re drinking a highly nutritious juice filled with more calcium, zinc, and other nutrients than other juicers produce. You’ll get the most delicious quality beverage with this professional grade juicer. The Tribest GSE-5000 does come with several attachments that allow you to make juice with more pulp, use as a food processor and even add in more types of ingredients. The feed chute is a bit smaller so you have to chop up the hard fruits, vegetables or nuts before you use it. An instruction manual comes with this that tells you the proper instructions for usage. You may spend a little bit more on this juicer, but this one is worth the wait. Within the category of juicers, there are several types available. You’ll need to know which type of juicer will work best for you and for your home. Other things to keep in mind are the type of fruits or vegetables you’ll be using, how often you use it and what kind of juice you want to enjoy. Here are the three kinds of juicers that are available on the market, and the main difference between them. A masticating juicer is the type of juicer that you use to get the refreshing cold-pressed juices that everyone loves. The system works by crushing the fruits and veggies with an auger after it’s fed through the chute. The machine then squeezes out the juice from the fruits and uses a film to filter out the pulp. Masticating juicers are also known as a cold press juicer or even a slow juicer. This is because of the time it takes and the process for getting a good juice out of the machine. When using a masticating juicer, you will have to cut up the produce into small pieces to feed it into the tiny chute. The name “masticating” comes from the way the machine “chews” up the product with the auger and metal teeth before it is pressed. Masticating juicer can also be used to make several other things similar to a food processor. Because of the high-powered motor extra features these machines have, they tend to cost a bit more money than their counterparts. The great thing is that you’ll get a multi-tasking machine that results in deliciously nutritious cold-pressed juices. A centrifugal juicer is known for being one of the faster, classic juicer models. This machine uses tiny “teeth” to grind up the product will it’s spinning it, hence the nickname “spin juicer”. While the machine is spinning, the pulp and the juice is separated and put into a chamber. Because the juicer is spinning fast, this could cause the contents to be heated and come out foamy, which some claim reduce the quality of the juice. A centrifugal juicer is best for those who tend to juice harder fruits and vegetables like carrots and apples. They have larger chutes, so you can save time on cutting up the produce and put in larger chunks or even whole produce. They also can make a cup of juice in under a few minutes, which is the fastest of the three, hence the fast juicer nickname. 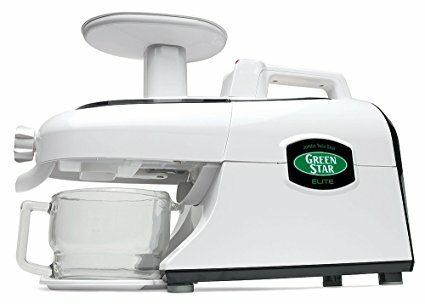 If you’re new to juicing and want a simple machine that works fast, is easy to clean and won’t break the bank, then a good quality centrifugal is a great option for you. A twin gear juicer, also known as a triturating juicer, has two gears next to each that crush and grind the produce. The twin gears crush and grind the vegetables and fruits and extract the juice from that. Twin gear juicers are great at extracting juice from drier substances and the rest of the pulp is expelled from the machine. You can use your hardest, driest substance with this juicer and still yield a great juice because of the two powerful gears. They also make delicious, nutrition high juices because of the way they grind and extract the juices. You can also use these machines for more than just juicing, similar to the masticating juicer. Out of all of the juicers, these tend to be the priciest option because of their fancy process and strong motors. You will also be getting some great food processing functions out of these machines, so it may be worth it to fork over the money for one. In addition to the different types of juicers, here are a few things to watch for when shopping for a juicer. These different aspects are all important to keep in mind while shopping for the best juicer that will fit your household and lifestyle. Just like with other kitchen appliances, the power output indicates how strong the motor is. This is usually directly correlated to the amount of time it takes to press a juice or even how much juice is able to come out. The higher powered juicers have strong motors that are able to crush the produce, extract juice, and separate pulp excellently. Some lower-powered juicers may not get out all of the juice you need or may take longer to use. The noise level of your juicer is important to find one for your home, especially if you live with others. If you want to be able to enjoy a juice every morning, then a loud juicer could disturb your other housemates that are still asleep. Keep in mind that if you live alone or don’t juice early in the mornings then this may not be such an issue for you. Centrifugal juicers tend to be a lot louder because of how fast they work. Twin gear and masticating juicers work a bit quieter but do take longer to create the perfect juice. It happens to the best of us. We buy a new shiny kitchen appliance that we get excited about, only to have it sitting at the bottom of our shelf months later, hardly used. This usually has to do with a product’s ease of use. A juicer may make you a delicious cold pressed fresh juice, but take ages to put together and put apart. Some juicers have large chutes that make it easy to put fruits and vegetables in. This cuts down on the time you’ll spend chopping up your produce before you use it. Additionally, if the juicer has a pulp chamber that collects it, this means you don’t have to worry about it collecting it yourself. Ideally, a good juicer should make your juicing life much easier. Ease of use also has to do with the amount of counter space in your kitchen. If you have a smaller kitchen, you’ll want a juicer that is simple to assemble, disassemble and clean so that you can easily store it. Do you plan to keep your juicer on the counter or store it after each use? Regardless of your preference, this is an important factor in choosing the perfect juicer for you. If you have limited counter space, the size of the juicer is important. If you plan to store, the size is equally as important as you don’t want it taking up too much space there either. Some of the high-tech, masticating juicers are more difficult to move around because of their horizontal shape. If you don’t have much counter space and plan to move it to storage frequently, this can be pretty tedious. There are many centrifugal models that are much narrower and can be stored easily on the counter or even in storage. Consider the weight of your juicer as well if you plan to move the machine back and forth from counter to storage. There are plenty of lightweight centrifugal models out there, whereas a twin gear or masticating model may be much heavier and generally more difficult to move. When testing out the various models, brands, and types of juicers, you want to make sure the product is durable. This goes down to the make, the quality of the pieces and even the materials used. A good place to check for the durability of a product would be sites like Amazon, where users write reviews after months of owning the product. 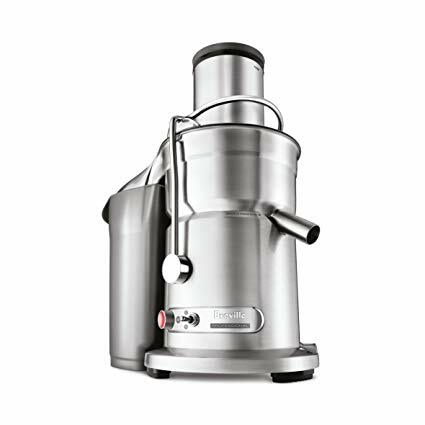 A good juicer will have reliable materials, such as the auger and the “teeth” that is used to grind up the materials. You also have to look at the motor quality and the quality of the individual materials. Juicers can be extremely messy and hard to maintain. Although nowadays there are so many makes and models that make this process a lot easier. A juicer that is difficult to clean discourages use and may end up sitting in your shelf instead of being used. Make sure to look into the model’s cleaning and maintenance so you know what you’re getting yourself into. Some juicers have a pulp container that makes it easier to clean and keep using, whereas with others you may have to pause to empty the pulp. Also, be on the lookout for juicers with a special cleaning brush that can clean the various parts. Overall, you want to make sure you regularly clean and maintain your new juicer, as this will ensure durability. If you plan on using your juicer at least once a day, this is something to seriously keep in mind. Just like any other household appliance, juicers come with a warranty on the entire machine and its parts. Keep in mind the length of time a juicer is under warranty. Most reputable companies offer full, longterm warranty and will replace any parts that malfunction. This is important because of the time and money it takes to fix different parts of the machine. If you have a juicer with a limited warranty, things can get tricky if you ever need to file a claim. Be sure to check each product’s reviews or the main website for the detailed information on the warranty. You never know when it’ll come in handy (and it does) and you don’t want to be caught in an annoying or expensive situation.